Sound like fun? Yes! Sure, it does! 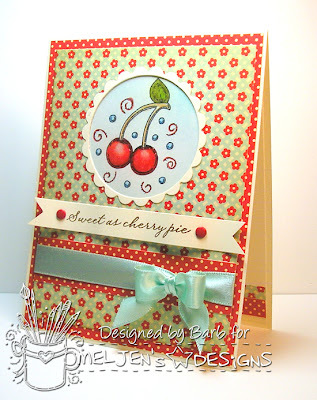 So grab a MelJen's Designs image and create and share with us over on the challenge blog. There is a 50% off sale going on right now in the Shop, so scoot on over and add a few new digital stamps to your collection. I decided to feature these sweet Retro Cherries. I love cherry images and these are delish! Keep in mind, digital stamps can be re-sized to fit whatever project you're working with. I was able to size my image, so it would fit neatly into my scalloped frame. I used OA Modern Homemaker patterned paper. I think it adds to the retro feel that I was going for here. After coloring my image with Copic markers, I applied some Crystal Effects to make the cherries shiny. Fun! Fun! I know that a lot of us have children going back to school now but, take a little time to be creative and join in on the challenge. You could win FREE digital stamps of your choice. Just be sure to use a MelJen's Designs image in order to be included in the weekly random drawing. Thanks for dropping in today! I appreciate the visit. This is very sweet, Barb! Lovely colors and design.